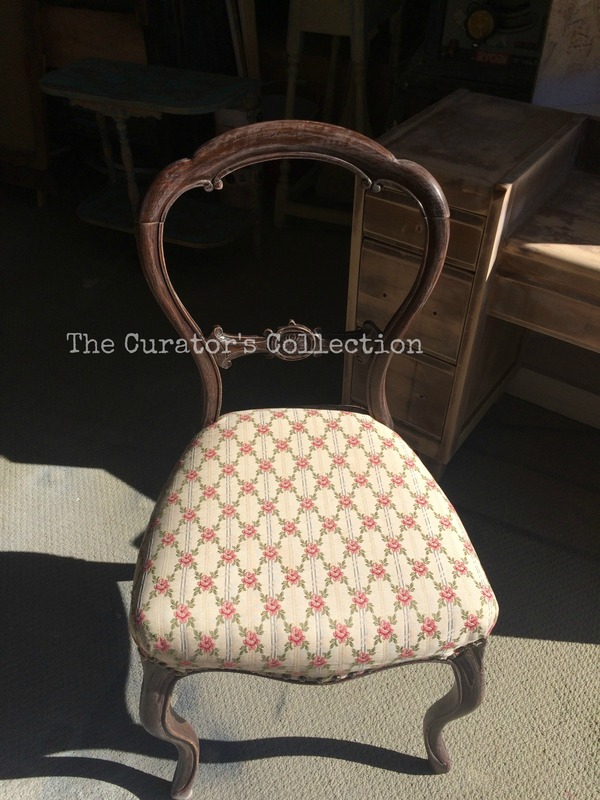 You may remember a while back I had given this little Victorian balloon back chair a make over. well…it sold immediately at a market I was participating in and I probably could have sold 10 of them that day had I had enough of them! A few months later I was fortunate enough to get my hands on another one that was similar but with a few subtle differences in the details. I did not get a “before” photo of it in my excitement but It looked very similar to the first one only with tattered upholstery … making it the perfect subject for a makeover! 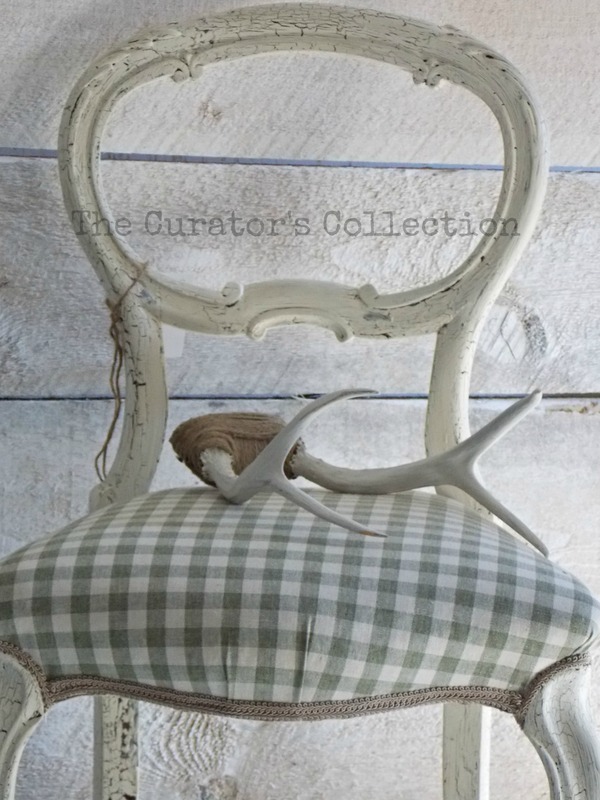 I used warm white FAT Paint and a crackle medium on the wood frame and a farmhouse sage green check on the seat to give it the perfect elegant farmhouse look. 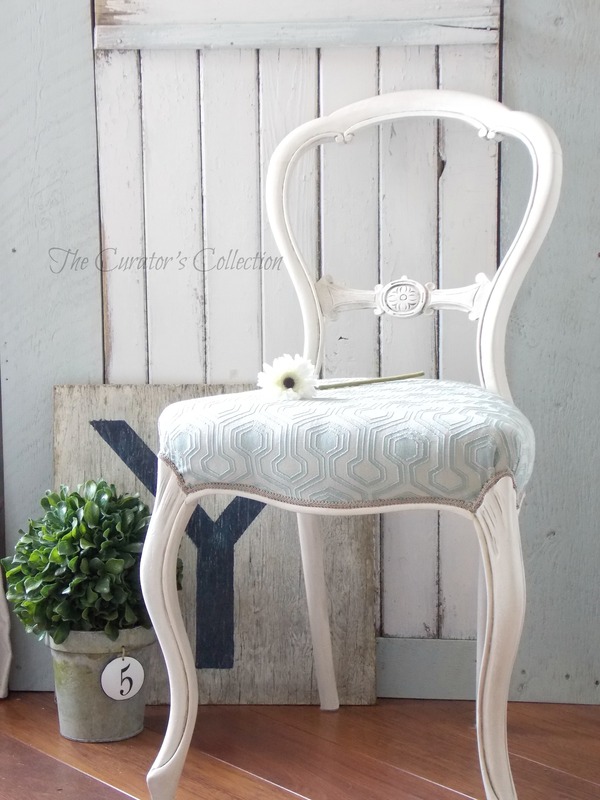 Love how this chair can go from fancy to casual yet elegant just by changing the fabric and the finish. 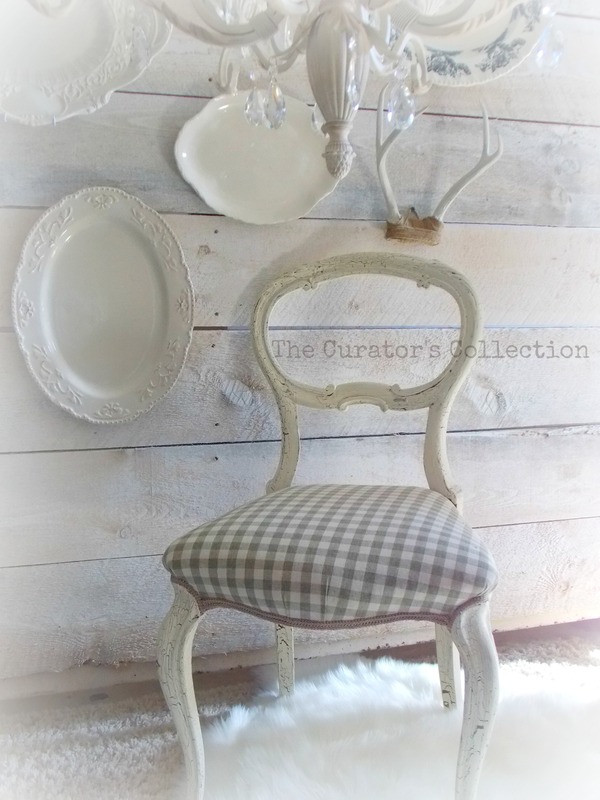 This is what I love about making over furniture … the looks are endless for every piece! It would look entirely different if I painted the wood metallic and used a rich jewel toned velvet for the seat… or… paint the wood hot pink and use a vibrant embroidered floral fabric and you would have yet another fun and amazing look! I could go on and on and on, but I’ll save you the rant! 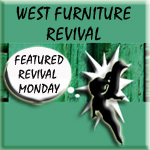 Enjoy these photos of this makeover instead! So good to see another blog post from you, Terry – I’ve missed them. 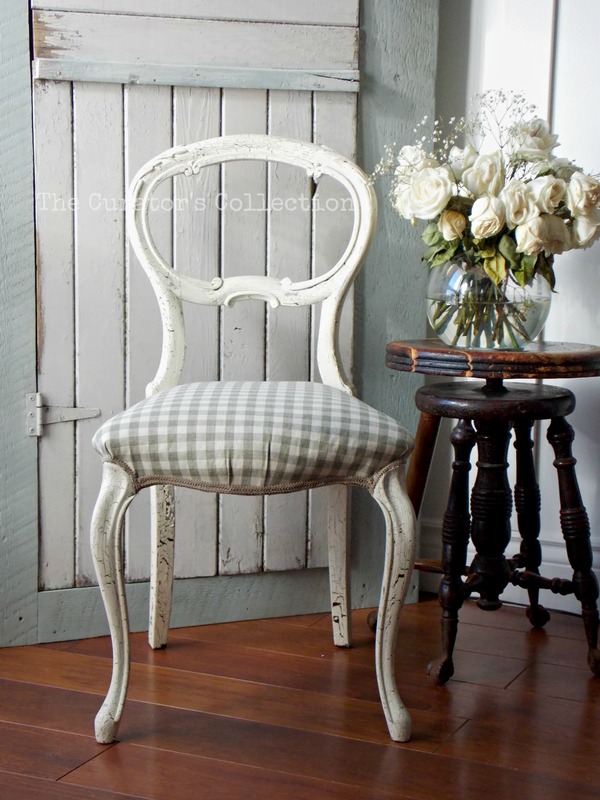 I would have never thought to use crackle medium on a chair frame – love the look! Hey Marie! Good to finally post something ;). 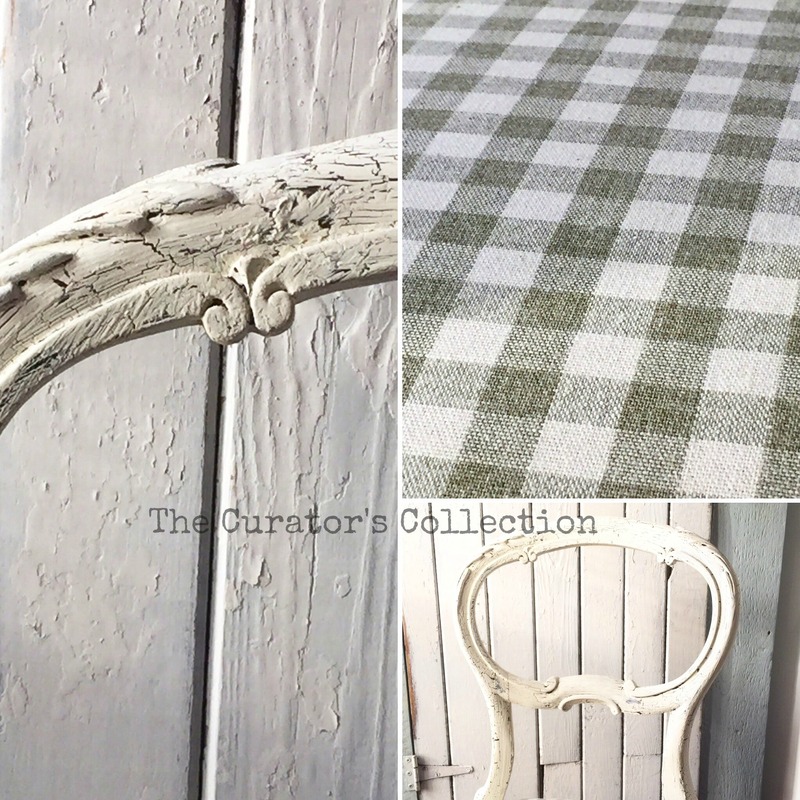 I am most definitely posting on those chairs … just need to find the time… seems I’ve been a serious procrastinator lately when it comes to finally sitting down to post…. or is it laziness??? …. seems I am pressed for time anymore and have taken the easy and ever quick posting to FB or instagram lately! Plus it gives me instant gratification to share immediately…. hmmmmm ;/ I promise to post the “twins” soon! Thank you for taking the time to comment Marie! I hope you have a great weekend! It’s beautiful! Soft and pretty. Thank you so much Becky! I hope you have a great weekend! I have missed you. Both chairs are beautiful. Please don’t be a stranger. Thank you Debra! I will try not to wait so long for another post! Thank you for popping by! I hope you are having a great week so far! Your balloon chair makeovers are so amazing that you’ve inspired me to look for one to makeover myself … went out to my local Craigslist and found two. The first is $125 and the second, $130! Ha! I guess I’ll just continue to be on the lookout for one that is reasonably priced :-) And meanwhile I’ll just have to admire yours. 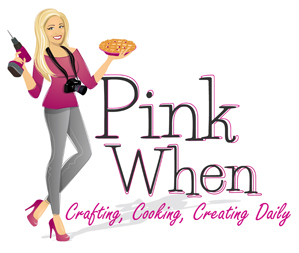 I hope you can find one reasonably priced to make over soon … I’m excited to see what you do! :) I hope you have an amazing day!